Events can be enabled or disabled. The event’s enabled state determines if the event can be scheduled. If an event is disabled, the event can not be triggered and thus the event’s actions will not be performed. If an event is disabled, it can not be performed. Enabling an event will allow the event to be scheduled ready for performing. An enabled event will be immediately scheduled. If appropriate, the event will be added to the Schedule Engine’s pending and on demand lists, see the section called “Pending Events”. Locate the desired event in the events view. Click on the event’s associated checkbox to enable ( ) the event. A disabled event can not be performed. If the event supports being triggered on demand, this behaviour will also be disabled. Disabling an event will immediately remove the event from the pending list and on demand list. Click on the event’s associated checkbox to disable ( ) the event. 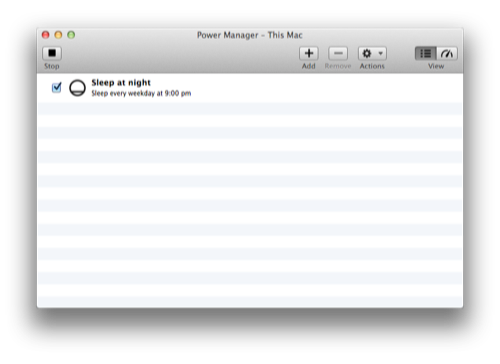 Power Manager is capable of editing all events, regardless of the tool used to create the original event. 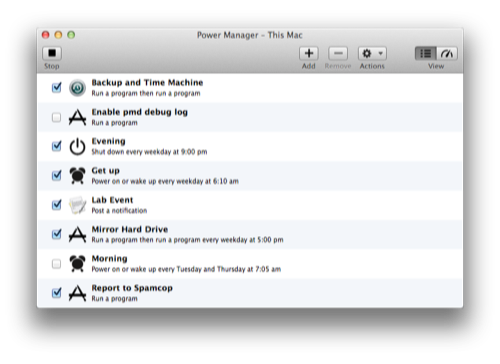 Events created with the Schedule Assistant will be edited using the Schedule Assistant. All others events will be accessible through the Event Editor. Locate the desired event in the events store view. The Schedule Assistant will appear ready for editing. You can click the Cancel button ( ) at anytime to discard changes. 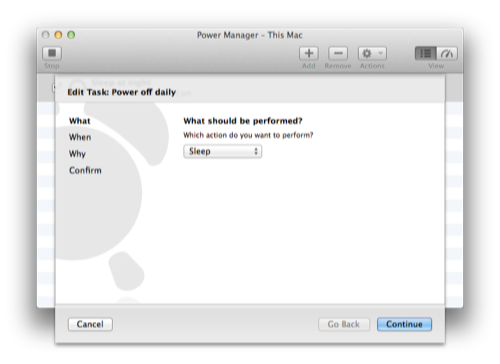 Step through the Schedule Assistant by clicking on the Continue button ( ). The final step will confirm any changes. Click on the Save button ( ) to save the changes to the event and update the schedule. 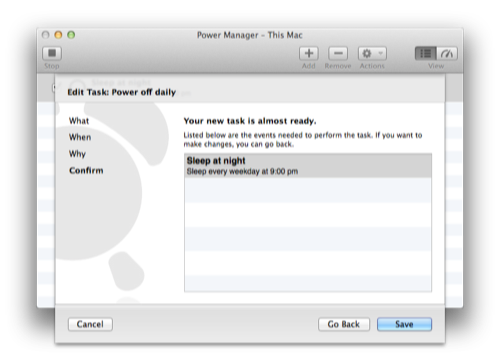 An event can be removed from the schedule using the Power Manager application. Removing an event immediately dequeues the event’s triggers and stops any performing or pending actions associated with the event. Select the desired event or events in the events store view. Select the menu item Edit Delete to remove the selected event or events.